Microsoft refreshed its Surface Pro series with the new Surface Go. This entry-level model is smaller, lighter and less expensive, which are all attributes that fit into Microsoft’s drive to win back the education market. Out of the Surface Pro series, this Surface is the thinnest and lightest at 8.3 mm and only weighs 1.15 lbs. (521 g). The display is also smaller at 10-inches in 3:2 aspect ratio. One considerable upgrade is with the Intel Pentium Gold 4415Y processor, offering a 1.6 GHz frequency. 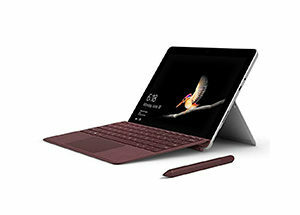 Surface Go also features a 5 MP front camera for 1080p video, 8 MP rear camera and 9 hours of battery life. The base model comes with 4 GB of LPDDR3-1866, and 64 GB of eMMC storage. You can get it in 8 GB RAM versions with 128 GB and 256 GB NVMe SSDs, for much better performance. There will be LTE and 256 GB models available down the road.